It has been seen that human being’s are competing with the robots in terms of speed. With the fast moving lifestyle, people have limited time to spend on cooking and other time consuming activities. 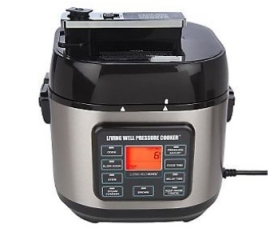 To address this concern Living well pressure cookers have come up with the fastest and the most convenient way to cook any cuisines. I took a trail of this pressure cooker and to my surprise I found all these features listed below. There are many second hand pressure cookers too available. I would recommend you to put in the extra money and go for a fresh piece and if you plan to buy one second hand piece make sure that your country extension office checks the seal and pressure for you properly to ensure your safety. Don't buy this pressure cooker. There are many reasons why I am not suggest you to buy this. For the same price you get better digital pressure cooker which its replacement parts are available and better company provide reliable support. Found some complaint about this pressure cooker, such as the seal leaking all around and got an F2 error after use several times. I think it is better not to waste your money, spend it on something with a quality name on a better pressure cooker that will work for you.